Day 01: Arrive at Kathmandu airport (1345meters)and Drive to the Hotel. Day 04: Trek to Lama Hotel (2380m) 5/6 hrs. Day 05: Trek to Langtang village (3,430m) 5/6 hrs. 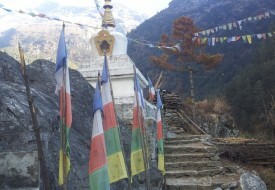 Day 06: Trek to Kyanjin Gompa (3870m): 3/4 hrs. Day 08: Trek to Yala peak Base camp (4400m) 5/6 hrs. Day 10: Trek back to Lama Hotel. 5/6 hrs. Day 11: Trek to Thulo Syabru: 5/6 hrs. Day 12: Trek to Dhunche 2020m 4/5 hrs. Day 14: Drive to International Airport and final Departure.